When it comes to finding a stroller for your children, you’ve probably already realized that it is a difficult task and it doesn’t come easy. You might not like certain features or you might not like everything that it has to offer. Now, when it comes to trying to find a multi child stroller that will seat up to six children at a time, your choices are relatively limited. However, you can count on Foundations Worldwide Foundations 6 Passenger Stroller because not only will it accommodate all of your kids, it will also provide you with one of the best stroller experiences possible thanks to some excellent features that you will find out below. Since the safety of your children in a stroller is going to be one of the most important parts of the stroller, you’re going to love the safety features that are included in this stroller. Every single seat has a 5-point safety harness to make sure every single child is secured in the stroller and does not move around when you hit any bumps or cracks on the road. The SafeBrake system on this stroller is one of the best features on the stroller that you’re going to find because it is going to make sure that your child is always safe. This system will automatically engage when the person steps away from the stroller. This means that even if you aren’t by the stroller, you won’t have to worry about it rolling away or rolling somewhere it shouldn’t. This stroller is complete with some of the largest wheels in the industry. These extra large wheels help make it easy for you to maneuver over any bumps or cracks that you might face during your ride. Not only does that make it easy to steer, but that means your children won’t feel the bumps as much. The seats on this multi child stroller are specifically designed to help give your children maximum comfort no matter how long they have to ride. Every single stroller is designed to provide extra large seating areas along with additional headroom so even when your children are older, they will be comfortable. When you consider the weight of this stroller, it’s actually pretty amazing to realize that the whole stroller only weighs 107 pounds. Now, I know that it might seem like a lot of weight, but when you consider a standard stroller can weigh around 25 pounds, it’s amazing that this only weight 107 pounds. It will be tough to maneuver for just one person, but with two people you will have no problem unfolding and using this stroller at all times. Despite the large size of the stroller, you’re going to love to see just how easy it is to fold up this stroller when you are finished with it. Thanks to this easy fold design, you will have no problem folding it up and bringing it with you wherever you might need to take it. This particular multi child stroller is actually going to be one of the largest and most accommodating strollers that you are going to find on the market today. This stroller is specifically designed to help seat up to six kids at a time (two wide, three deep) and each child can weigh up to 50 pounds so that this stroller will accommodate your children for a long time. As it stands now, this stroller is going to only be available in one color, so if you’re looking to find a stroller that gives you a lot of different color choices, this isn’t going to be the one for you. However, the blue color that it comes in is both stylish and looks great so that no matter where you are, the stroller will blend in and fit great. You’ll love the blue color especially if you are going to use it for boys more than you would for girls. Now that you have read about all of the features and specifications of this particular stroller, I think it’s safe to say that you have realized all of the benefits that you are going to enjoy when it comes to Foundations Worldwide Foundations 6 Passenger Stroller. Despite being large considering it is a stroller designed for up to 6 children, there are great features such as the SafeBrake system, the large sun canopy and the large storage baskets underneath that help make it easy to carry anything you might need to bring with you. 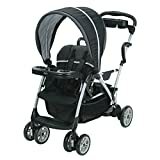 If you are looking for a multi child stroller, then I strongly suggest you consider this stroller as an option.